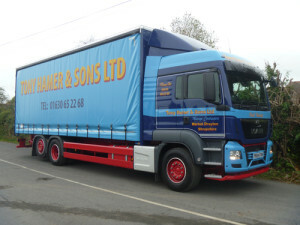 Our curtainsiders are built to the most exacting standards and are available using a variety of designs including buckled or buckles designs and can include a mix of solid GRP sides and curtains if your operation dictates. Rear access can be via a selection of barn door designs, wide slat roller shutters or matching curtains. Internally the same options are available as on a dry freight box body including a wide variety of hard and softwood floors with or without overlays and with as many sunken lashing rings as the operation requires, bespoke step arrangements for safe access and egress as well as a wide range of internal cargo restraint systems including reinforced curtains, sliding poles and / or cargo straps. In addition to the above, our normal options for additional lighting both internally and externally are available as well as numerous specialist tool box designs and GRP cab and body aerodynamic aids / skirts to assist your image and fuel consumption returns.